Croissants are a crazy-good cross between yeast bread and puff pastry, two of my favorite things. The buttery, yeasty aroma and flavor, the shattering flakiness you can actually hear, along with the contrasting textures and general gorgeousness make croissants a feast for all the senses. Are they a lot of work? Well, they take a bit of time. But most of it is waiting time, not actual work. And a day or two of this doable amount of work and quite a bit of waiting will reward you with three batches of 9 croissants. Are they worth it? Yes! If you get as ecstatic over them as I do, definitely! Croissants have been a French breakfast (petit déjeuner) staple since the 19th century, and there is actually a law about their shape. By law, only a croissant au beurre, made with 100% butter, can be straight. And a croissant ordinaire, made with margarine (or anything besides 100% butter), must be curved. Anyone who knows me knows I'm all about the butter, baby! So I just call them croissants because you know I wouldn't make them with anything else. Some people claim you must use the "European-style" (at least 82% butterfat) butters in croissants, but I can never find one of those that is organic*. Since American butter must have at least 80% butterfat, I'm sticking with the organic and just not sweating the two measly percent! * There is one that I know of, Organic Valley European Style Cultured Butter with 84% butterfat, but it is never stocked where I shop. As always, I think the key to consistently good results in baking is to use the same products every time. So I always buy the same brand of organic unbleached all-purpose flour, the same brand of organic butter, etc. No use developing a croissant recipe with a butter I have to special order and wait for when the croissants made with my usual products are so good! I've found this proportion of ingredients makes a dough of just the right consistency. And I've found, through my experimenting, that a preferment, or poolish, really doesn't add anything. The dough spends enough time resting in the refrigerator or rising (twice) on the counter to ferment and develop plenty of flavor. What do you like on your croissants? I especially like raspberry jam, but I have been spotted putting butter on them as well. I know, coals to Newcastle, right? Update 01/11/18: This croissant dough makes *the* best Croissant Cinnamon Rolls! According to Jacques Pepin, small croissants are about 1.25 to 1.5 ounces each and large are about 3 ounces each. So I decided to call mine medium. * A bench scraper works beautifully for this. 2 In bowl of stand mixer fitted with dough hook, stir together flour, sugar, salt and yeast. Using an instant-read thermometer, make sure the temperature of the milk-butter is not above 120 to 130F/49 to 54C before adding it to flour mixture. Mix on low speed for 3 minutes, until ingredients come together into a shaggy dough. Increase speed to medium-low and mix just until dough is smooth, 1 or 2 minutes. 3 Place the ball of dough into an 8x8x2-inch baking dish that has been lightly sprayed with cooking spray. Flatten it out to fit the square, cover tightly with plastic wrap and let stand at room temperature until the dough has doubled or at least increased by half, about 1 1/2 hours. 4 Uncover the dough, lightly oil your hand and flatten the dough using the palm of your hand. Cover tightly with plastic wrap and refrigerate until chilled through, about 2 to 4 hours. 5 When there's a half hour remaining, make your butter sheet. 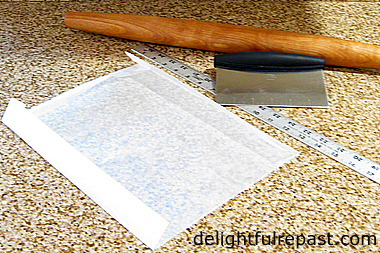 Fold a 26-inch length of parchment or wax paper in half widthwise and fold up the open sides to make a 12x9-inch package. Unfold it and place it on the work surface. Arrange the 12 slabs* of butter on one end of the paper within the "package" area; let stand for 15 to 20 minutes to come to room temperature. Refold the package and turn it over so that folds are underneath. 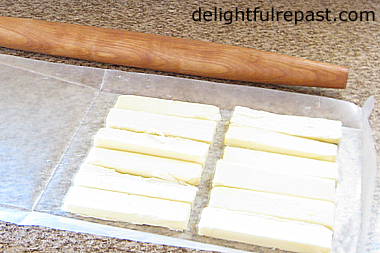 With a rolling pin, roll the butter in an even layer to fill the package. Put it in the refrigerator for 10 minutes or so to chill down and firm up a bit, but not too much. * If your brand of unsalted butter comes in shorter, thicker sticks than mine, then you might cut your sticks into 4 slabs each instead of 3 and then arrange them a little differently on the paper. It doesn't matter; you'll even it all out with the rolling pin. 6 Lightly flour* work surface. 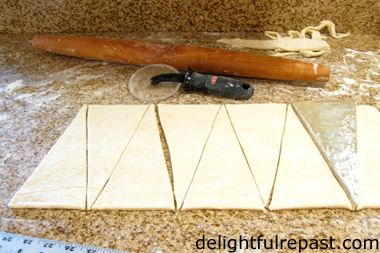 Unwrap the dough and roll it out to a 28x10-inch rectangle. 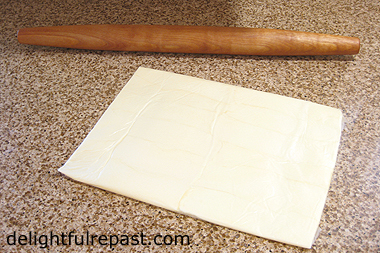 Peel the parchment away from the butter and flip it, long edge in front of you, into the center of the rectangle of dough, leaving an 8-inch section of dough at each end. 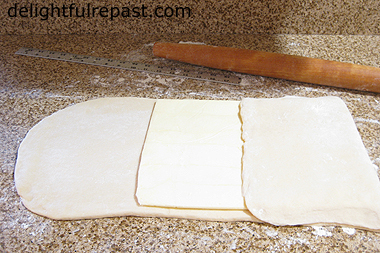 Fold those ends of dough over the butter sheet, meeting in the middle. * Use only as much flour as you need and always brush off the dusting flour when you're folding so there won't be dry flour between the layers to ruin the pastry. Note: You may need to refrigerate dough between second and third turns if the dough is too warm. If at any point in the process the dough is too warm, stop what you're doing and refrigerate it. The butter must not be allowed to melt. 9 For the fourth and final turn, roll out the dough to a 28x12-inch rectangle and fold it like a business letter, making a 12x9-inch rectangle. At this point, I cut the rectangle into three 9x4-inch pieces and wrap them individually. I refrigerate one for baking 9 croissants the next day and freeze two. 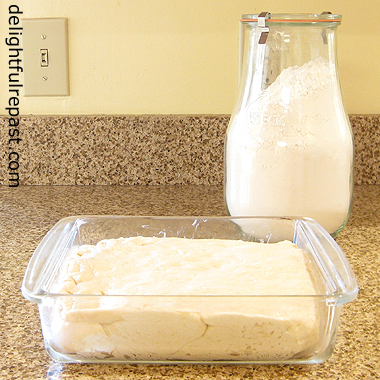 Frozen dough should be transferred to the refrigerator to thaw overnight. Note: Croissants are best eaten the day they are baked, and this way I can have three batches of 9 fresh croissants. 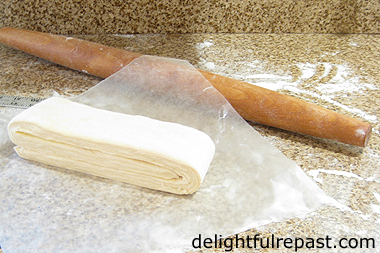 10 Next day, bring the dough out of the refrigerator 20 minutes before you want to start rolling it out for croissants. 11 Form and proof the croissants. For each 1/3 of recipe to be baked, line a heavy-duty half sheet pan with parchment paper. 12 On lightly floured surface, roll the third-recipe piece of dough into a rectangle a little over 9 inches wide, 20 to 21 inches long and about 1/8 to 3/16 inch (4mm) thick. Trim the width to an even 9 inches. With plastic pizza wheel (won't damage countertop), cut into 9 triangles 9 inches high and 4 inches at the base. Note: I know some people make their triangles by cutting 9x4-inch rectangles in half diagonally, but that makes right triangles rather than proper isosceles triangles with the point in the middle. (Hey, what can I say? Mr Delightful is a mathematician, and I may or may not be a little obsessive!). So I made a cardboard template and, because who knows where that cardboard has been, covered it with foil. 13 To shape a croissant: Hold up a triangle of dough by the wide end and give it a slight stretch (making it perhaps 2 inches longer). Lay it on the work surface with the base closest to you and press down on the point to stick it to the counter. Starting at the base, roll tightly all the way to the tip. Transfer tip side down to parchment-lined half sheet pan. Repeat with remaining dough. 14 Set the baking sheet in the cold oven and place a pan of boiling water on the bottom of the oven. This will keep the croissants from drying out. Let rise until doubled, about 2 to 3, even 3 1/2 hours. Be sure to take them out before you preheat the oven! Note: Shaped croissants can be frozen. The night before you plan to bake, transfer them to a parchment-lined baking sheet, tent loosely with plastic wrap and thaw in refrigerator. 15 Preheat oven to 450F/230C/Gas8. In small bowl, whisk together egg and water until frothy to glaze the croissants. 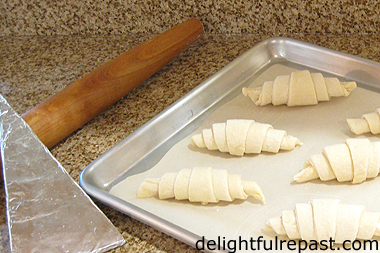 Brush the risen croissants with egg wash and then again just before baking. As soon as you put the pan in the oven, reduce heat to 400F/205C/Gas6. Bake for 20 to 24 minutes. Cool on baking sheet for 10 minutes before serving. Serve warm or room temperature. 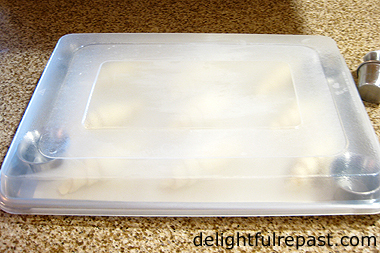 Note: To freeze baked croissants, cool completely and wrap airtight. Then just unwrap and heat unthawed croissants at 375F/190C/Gas5 for 8 to 10 minutes. They are bakery perfect! I haven't baked croissants in a really long while...maybe I should start a batch too. Homemade croissants are so fresh and good. Thanks for sharing, Jean. Thank you, Angie. I love making them. And I now have four pieces (9 croissants each) of dough in the freezer, and that makes me very happy! Wow! These look so yummy but I think I will stick to the ready made refrigerated ones they sell in the stores, lol! Happy new year, Jean! I can't even imagine defiling a beautiful croissant with peanut butter. But having stated that opinion, this was a wonderful tutorial! I followed you through every step and could almost taste the finished product with homemade raspberry or strawberry jam or either with a wee bit of cream cheese. I'm afraid that if I had nine, I would be tempted to eat more of them than I should. But this was a delight. Christine, thank you. It IS a lot of work, but it's soooo much fun! Wishing you a wonderful 2018. Thank you, Judy! I'm so glad you hung in there through all the steps. I kept wondering where peanut butter came into it, but maybe you thought my apricot jam looked like peanut butter? Oh, these look lovely, Jean! I have never eaten home made croissants and I imagine they are so much better than bakery ones. Home made is always better! I used to make my own bread when the kids were growing up but never croissants. Thank you for sharing your recipe. I would love to try one of yours with some jam and a hot cup of tea! Happy New Year! Thank you, Sandi. Yes, soooo good with a cup of tea! My husband thinks I'm very scientific in the kitchen and that I should wear a lab coat! Your croissants look delicious,thanks for the tutorial.Hugs! Thanks, Maristella. Hugs to you! Like a work of art! Beautiful, Jean! Thank you, Ellen! I tried to make 'em pretty! Wow - talk about detailed instructions. If I can't follow these, there is no hope! Ha! Looks wonderful and thanks for sharing Jean. Yummmm! How I love them, but with my bread addiction I must not learn how to make them. I would be eating them all the time. 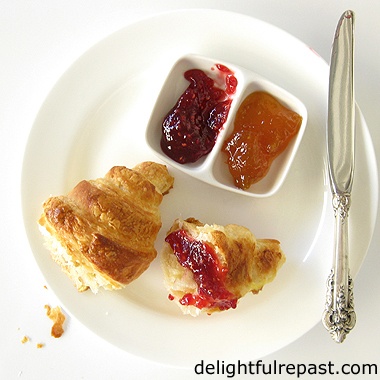 Oh and raspberry jam is soooo delicious on a warm croissant. Croissants are something that I have never tried baking, but do love to eat! I'd take my homemade raspberry jam on mine, too, or my Christmas jam. Since I love bread baking so much, I really need to try these, Jean. Thank you for your recipe and inspiration. this is so very precious to me :), thank you Dearie! Bernideen, I'm glad you like my detailed instructions! I like to include enough information so that someone who has never attempted them before can have success. Hope your year is off to a fantastic start! Thank you, Kitty. And I can see your sweet granddaughter enjoying brushing on the egg wash while they're proofing! Dany dear, thank you. And I hope your new year is off to a wonderful start! Martha, thank you so much. And you may certainly tuck a piece of dark chocolate inside them before baking! I did not know about straight and curved croissants, Jean. I always have croissants when in France.They are usually the curved type. I like fresh baguettes too, first thing in the morning, straight from the local Boulangerie. If you ever stay in a small French village you can see the bakers working from the early hours preparing copious numbers of baguettes. Every French man and woman must have their baguette.I love French markets the best. Every region has its own particular cheeses. The French seem to have created an innumerable number of cheeses. I must get adventurous and try your recipe. Tony, if I ever visit a French village, I'd definitely like to see the bakers making the bread. I know they work a lot faster than I do! I hope you will get adventurous and try my croissants. I never knew about the butter criteria for straight vs. curved croissants. Interesting! I usually eat my croissants with butter, although I have enjoyed some that contained chocolate inside! Your croissants are perfect! I'm with you, butter all the way!! High Fiving! We made croissants a couple of times in Culinary School. So worth the time and effort - but I've not gotten up the courage to make them at home. You've inspired me. Thank you, Marcellina. Butter really IS better! And I must try your lime and blueberry cake soon! Thanks for the High Five, Lea Ann! My husband always says, Isn't that a lot of trouble for something that isn't even a *meal*? They DO look beautiful AND so good . . . maybe I'll let YOU come make them for me haha! Nothing like homemade I'm sure! Lauren, thank you! That would be soooo fun! I don't know that I will ever make these but i sure am thrilled to know the procedure and to see such well organized and beautifully laid out photos. You make it seem easy (if time consuming! ).Maybe I'll pass this one on to Rick! It's tough to get a really good croissant here. Jeanie, thank you! And from what I've seen of Rick on your lovely blog, I think he could really have fun with this! Happy New Year, Jean! Croissants are on my "must-try" list for this year. I've never made them from scratch before although I love to eat them from bakeries!! So glad to have your tutorial to refer to when I get there!! Thank you, Marcelle. And DO, please, let me know if you have any questions. 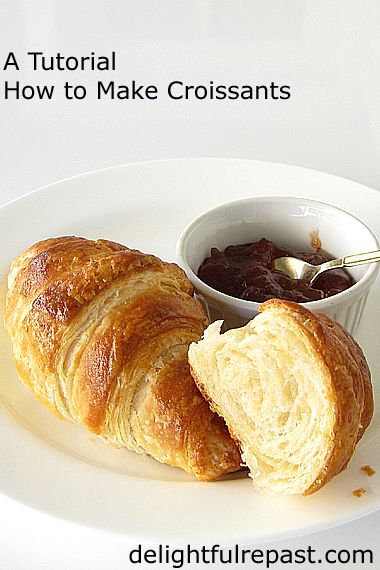 I want to make sure my instructions are as complete as possible for those who have never made croissants. They do look scrumptious. 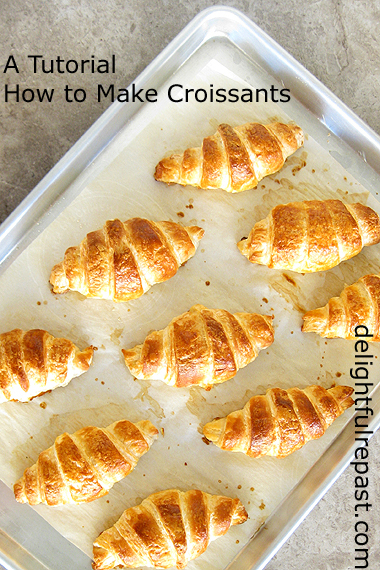 I adore croissants and you have written an excellent tutorial but I know I wouldn't have the patience to make them. Polly, thank you. And I know what you mean about the patience. I'm someone who can happily experiment like a mad scientist in my kitchen all day long, but there are plenty of other pursuits I don't have the patience for. I really, really, really want to make croissants this year. This is my year for buttery flakiness! I love your photos (soooo helpful) and will report back when I do it! One issue I see is finding butter where we live that comes in sticks like yours. In Tucson (and a lot of the West) the butter sticks ar3 shorter and wider. Who knows why - they all come from the same company! David, that won't be a problem. If they're thicker sticks, just cut into 4 slabs instead of 3. Just cut them any way you need to fit within that package. It will all get evened out when you take the rolling pin to it. I can't wait for your report! And do tell me if you have any questions because I want to make the directions as thorough as possible. Thank you, Roseann. I always have fun making croissants. And thank you for hosting! Your croissants look delicious. I would like one now with some yummy jam. Thanks for sharing the recipe. Enjoy your day and new week ahead! Eileen, thank you. I'll be baking up another batch today. Come on over! Your Croissants look amazing! Your tutorial is so detailed it makes me think that just maybe I might be able to make these lovely treats. Your Croissants look like a light fluffy cloud and just heavenly! Happy to see you here at Full Plate Thursday and thanks so much for sharing with us. Miz Helen, thank you so much. That was my hope, that the post would be detailed enough so that anyone trying it could have success. If you make the recipe, do let me know if I haven't made any step clear enough. Mmmmm, your croissants look heavenly, Jean. As other commenters have said, your crystal clear directions are reassuring to those of us who are a bit less skilled in the kitchen. Funny, I wasn't hungry before reading your post....now I am famished!! Thanks, RR. That's my goal! I know whenever making something unlike anything I've made before, I find good directions make all the difference. So if I'm working from a recipe without them, I will often write them out for myself. It especially helps when I have several other things going as well. These are stunning! I used to have to help my (French) mother make croissant dough, and I hated it, which is probably why I’ve never chosen to make them from scratch as an adult! Love the tutorial. Mimi, thank you so much. Means a lot coming from a person who knows croissants! Although labor intensive, they are not as difficult as I would have imagined. They look delicious. Thanks, Judee. And that's exactly right -- not as difficult as probably most people imagine! Jean, I am totally impressed with your baking skills. Making croissants is an art and you have mastered it. Congratulations! Aaw, thanks, Gerlinde! I enjoy a challenge! Oh my dear Jean! These croissants look absolutely amazing! Yours must taste better than anything made in the stores. I would so love to try one of them and will save this recipe for a day when I can take the time it takes to make them. As you said, it seems to be a bit more time consuming than anything. I love your tutorial, as you share excellent instructions on how to construct them with the butter. Raspberry jam sounds perfectly delicious with one of these :) Happy New Year to you! Marilyn, thank you sooo much! Let me know when you pick the day to make them! Maybe it will be a day when I'm in all day and I can answer any questions that might come up as you go along. Have a wonderful 2018! Congratulations on a job well done, they are beautiful. Thank you, Karen! I know how to have fun! I love to eat them...but don't have the patience to make them...to lengthy a process. You are to be commended! In my life with so many hats...just not gonna happen. We do they come out of the oven...I'll be there! Lol! Thanks for linking to Tuesday Cuppa Tea! Ruth ~ LOL ~ I understand completely! I just feel like, as long as I can make the time for it, I need to make things like this from time to time to keep my skills up. But why I need to keep my skills up, I don't really know -- it's not as if I'm going to get a job at a French bakery or something. I miss croissants so much now that my husband is gluten free. Guess I will just have to make them for myself! Terrific post! I've made croissants, but it's been years. Heck, decades! (Inspired by Julia Child's recipe.) Really like your recipe/procedure. You're so thorough! Really good stuff. Heck, EXCELLENT stuff! Thanks so much. Letsmomitout, I usually don't make things my husband doesn't also eat because I don't have the time and energy to cook two separate diets. BUT I do make exceptions -- once in a while I just have to have one of my particular favorites that he doesn't eat. So, yes, make these just for YOU! John, thank you! I appreciate that so much! You got me Jean! You found my one enduring weakness: Croissants. As I really don't want myself to be eating gluten/CHO--forcing myself to make them if I want to eat them is a better way to go. And believe it or not I've never made them! Sue, that's wonderful! But, yes, you definitely want to pace yourself! Let me know how it goes. Thank you, Miz Helen! It's an honor to be featured on #FPT. Wait till you see this week's croissant cinnamon rolls! Aaaww, thanks, Annette! I do love making yeast doughs, laminated or not -- there's just something magical about the whole process! Kathryn, thank you so much! Heading over there now. Thanks, Dawn! Love the #DreamTeam AND your rhymes on every subject! I agree, Jean, croissants just have to have butter! Love your step by step instructions - they have never seemed so do-able before! 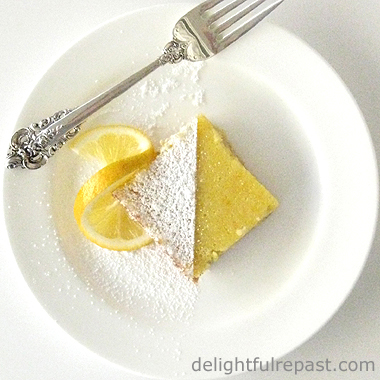 I'm featuring your post at the Hearth and Soul Link Party this week. Thank you so much for sharing it! April, thank you so much! And for the feature! Thank you, Agness. And I make them fairly smallish, not like the huge pastries sold at coffee places. I’m not very good at making delicate pastries lik croissants but I absolutely LOVE then and am willing to give it a try. I’ll be attempting these soon. I hope you will, J'adore. You'll have a lot of fun with them! Okay, Jean--I did it! I made a batch of croissants. I started reading the instructions and shopping for ingredients last Sunday and started making them Tuesday, finishing my 1st 1/3 batch on Wednesday. It was a bit grueling at first but then I figured it out. I'm not much on measuring exactly but I did try to conform a bit. My croissants were excellent! They even looked like yours. I had a surprise visit from my brother and sis-in-law (who lived in France) and they both said the croissants were professional! Today I'm rolling out my second 1/3 to serve at 'dinner and a movie' with friends tonight. Sue, you just made my day! No - my entire blogging year so far! I'm so happy that you made these, I can't even tell you! Kudos and hugs, my dear. HaHa, Jean! I thought you might like to share in my success. Sometimes it just takes time to get up the courage to try something new that's a bit more complex. My sis-in-law said all that was missing from the croissants was a cappuccino (too late in the day to offer). Hugs back to you!